Season Two of Photographs, Pistols & Parasols is coming soon. New episodes start December 1, 2017. In the meantime, do you have a question, suggestion, or perhaps the name of an early women artisan photographer you’d like to hear about on the podcast? Drop a line via email to podcast “at” photographers “dot” net, or use the contact form here on the website. 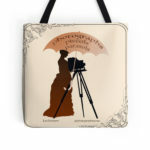 BTW, for those who have asked, the official Photographs, Pistols & Parasols tote bag is now available! You can order it in 3 different sizes from my Red Bubble store. As we move toward Season Two, I really want to thank all of you for your support of this project during the inaugural season of the podcast. It has been wonderful sharing these stories of these talented women with all of you, and I can’t wait to share more starting in December. See you then! Photographs, Pistols & Parasols currently relies on support from private donors; use the Donate button over on the right-hand side of this page to send a contribution. All donations, no matter how small, really help keep the project going. Thank you to all those who have already donated. Your help is greatly appreciated! If you subscribe to the podcast on Apple Podcast (iTunes), please consider leaving a rating and review. It’s free, and it really helps to boost the visibility of Photographs, Pistols & Parasols, which greatly helps to support the podcast. Hi everybody. I’m Lee McIntyre, host of the Photographs, Pistols & parasols podcast . Season Two of the podcast will start December 1st! I ‘ve got a whole new group of fascinating early women artisan photographers to introduce you to starting then. In the meantime, don’t forget to check out my website for the Season One episode notes and the photographs that went with them. You’ll find it all at p3photographers.net. That’s letter “p”, number 3, photographers dot net. Also, you can now follow me on Facebook, where I periodically post updates on my research travels, and also other news about early women artisan photographers. You’ll find me at facebook.com/p3photographers. Thank you all so much for your emails, your questions and your overall support during Season One of this podcast. I’m really excited to bring you more stories of women I’ve discovered over the last few months. As I said, new episodes begin December 1st.